THIS IS BY FAR THE MOST DIFFICULT of all half eagle designs to obtain. The reason is not low mintage (which might have been urged about the 1795-98 Small Eagle type), but the worldwide effect of the colossal influx of silver from Mexican and Peruvian mines. This enormous increase in the supply of silver on world markets compared with gold caused the price of silver to go down compared to gold, or in terms of Spanish (silver) dollars, caused an inexorable rise in the value of gold. This is the reality behind the old stories about the world ratio rising from Alexander Hamilton's original 1792 estimate of 15 to 1 to nearly 18 to 1. And its side effect was to cause gold coin to be hoarded and eventually melted down when its bullion value went enough higher than its face value. In the National Archives is a reference to public assays in Paris, 1831, at one of which sonic 40,000 U.S. half eagles of "recent mintage"—the 1820's—were melted and found to be of full weight and fineness; this was probably one of many such meltings, and more were to come after 1834. Virtually the entire mintages were melted, survivors amounting to minute fractions of 1%: for 1814, possibly 0.2%; for 1821, about 0.1%; for 1822, only three survive (two in the Smithsonian, the third in the Eliasberg collection), representing perhaps .02%; for 1829, the six survivors of each type taken together also mean about .02%. Larger mintages 1830-33 survive in slightly greater numbers, but the percentages are about the same. No date in the period 1821-34 Motto can be called less than Rarity 5 and most are a great deal rarer: fewer than forty survivors of each year, the only ones seen more often than once every five or six years being 1820, 1823, 1826. The vast majority of survivors are in the Extremely Fine to Uncirculated range. Only the dates 1813, 14, 15 are by Reich. It has been theorized that he was pressured into changing Ms. Liberty's effigy owing to the scandalous story that he portrayed his fat mistress on the coins; but if so, it is notable that her ultra-buxom figure did not vanish from the silver coins of the period. Reich left the mint at the end of March, 1817; when half eagles had to be coined again, they showed a coarse copy of the Reich design, without his "signature" (lowest star at right with one notched point), evidently by Robert Scot, whose sight was already deteriorating. There are numerous interesting varieties in the period, but most are so rarely available as to have excited little attention from collectors. Two reverse dies of 1813, one of which continued in use through 1815; all 1814's are overdates, 1814/13; 1818 sometimes shows S T A T E S O F as one widely spaced seven-lettered word, and this date and 1819 also share a reverse with D of 5 D. cut over a zero (as though for 50 C.). In 1820 there are several different styles of numerals with large or small letters. Most of the surviving 1825's show 5 over 1 in date; a unique proof in the Eliasberg collection shows 5 over 4, and in the 1947 ANA Convention sale was a mutilated piece claimed to be 1825/23. Beginning on some unknown date in 1829, William Kneass, Scot's successor, modified the design so that diameters are smaller as are dates, stars and letters; borders henceforth are of beads within a plain raised rim, unlike the dentilations formerly used. Varieties from now on are more minor, though in 1830 there are large and small 5 D, in 1831 large and small D, in 1832 twelve and thirteen stars, the former an extremely rare blunder (apparently five known including two in museums) and in 1833 large and small dates, the latter rarer. Coins of the final year with motto, 1834, come with plain or crosslet 4, the latter rarer; mintage was ended on May 30, and the final 24,568 remelted a month later, leaving only 50,141 in public hands, most of which were melted in August, 1834, and ensuing months. For the next few years "old tenor gold" coins provided the major source of bullion for new half eagles and quarter eagles, even displacing the African, Georgian and Carolinian shipments which had pre-dominated for the decade 1824-34. 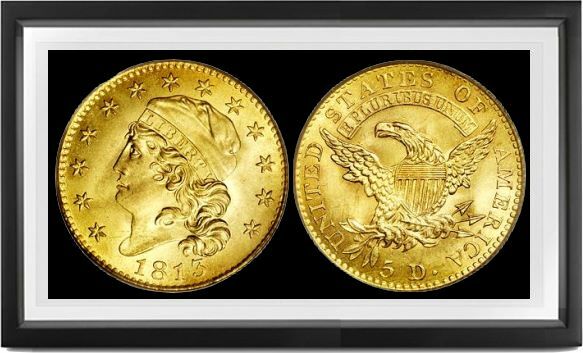 And the meltings in the 1830's have probably made the Capped Head half eagles the greatest overall challenge, even to type collectors.